Well, my tweets last night were mostly either bemused or rather negative, so I should emphasise that there were bits of the Olympic opening ceremony I thought were rather good. I liked the levers of the industrial revolution hoisting enormous smoking chimneys into the sky, though one gets the impression that nothing good came from this Saruman-style destruction except the forging of five giant gold rings to rule us all. A pleasing effect, but some other industrial achievements might have been nice: Stephenson’s Rocket, perhaps? The spectre of Voldemort hovering over children in hospital beds, until chased away by Mary Poppins, was quirky but amusing, though perhaps he was really hovering over the NHS? It, like so much of the ceremony, must have been completely bewildering to hundreds of millions of viewers. I cringed at some of the inevitable political correctness, was proud of the music we used to produce until about 20 years ago, was pleased by Her Majesty’s involvement in the Bond escapade and felt sorry for her obvious boredom at having to sit through the rest of it. It’s good that Tim Berners-Lee finally gets appropriate global recognition, tweeting ‘This is for everyone’ from the middle of the arena; given his natural humility it must have been a challenge to get him to agree. And the cauldron was, indeed, very pretty. To give a true history of modern Britain, I thought, we should have had a huge influx of Polish people at the end! And then I realised that they had probably been there all along, behind the scenes, making everything work. And work it did; it was certainly an impressive technical achievement, and it looks very good in the BBC’s six-minute edited highlights. Then the athletes came in, and many of them looked like rowdy drunken yobs coming out of… well… a sporting event. Still, I suppose that’s something else that the world knows us for. Now, I know I’m not the target audience for this stuff; I’ve made my feelings clear about the financial outrage that is the Olympics. For the same money we could have given a shiny new MacBook Pro to every schoolchild in the country. Or employed 1000 teachers for 400 years. Or… well… take your pick of better investments. So I tried to divorce my feelings about the ceremony from its association with the bigger picture. And as my friend Jeff Jarvis put it, to set the context for his tweets last night: “I cannot abide opening ceremonies or folk dances”. And I’m also very out of touch with popular culture – I recognised about half a dozen faces last night: the Queen, Rowan Atkinson, Sir Tim B-L, Daniel Craig and Kenneth Branagh. OK, five. But it would have been six if I’d stayed awake long enough to see Paul McCartney. So I imagine there were probably lots of sports personalities, soap-opera stars, rap ‘musicians’ and winners of X-Factor that might have been recognisable to others. It’s hard to imagine any other nation willing to make so much fun of itself on a global stage, in front of as many as a billion viewers. It takes nerve to look silly; the cheesy, kaleidoscopic history lesson that took Britain through its past, from pasture through the workhouses and smoke stacks of the Industrial Revolution to World War I and, of course, “Sgt. Pepper’s Lonely Hearts Club Band,” was like a Bollywood version of a sixth-grade play. But bad taste is also a part of the British heritage. The imagery mixed the glory of a royal Jubilee with the grottiness of a Manchester pub-crawl. Britain offered a display of humor and humbleness that can only stem from a deep-rooted sense of superiority. Some of the rest was bitty and disjointed; the sub-mobile-phone advert style of the digital section was particularly weak. It was more political than I expected. Voldemort loomed over the NHS. Tonight marked perhaps its final transformation from a healthcare system into a religion. Dancers made up the CND symbol. The Royal Family looked bored, but the new Right-On Royal Family – Doreen Lawrence and Shami Chakrabarti – got to carry the Olympic flag. The NHS segment in particular underlined how surprisingly parochial this ceremony was. The idea of the Health Service as a beacon for the world is, bluntly, a national self-delusion. Most other Western European countries have better state healthcare systems – and healthier people – than we do. Does the average Chinese person even know what the letters stand for? But I suppose the whole Olympics is in a broader sense parochial. Three weeks ago, I was in Libya witnessing that country’s first free election in sixty years: an end, or at least a beginning of the end, to decades of madness and tyranny which killed tens of thousands and blighted the lives of millions. To borrow the words of tonight’s over-excited TV commentators, that really was an inspirational and historic moment. Tonight, by contrast, was just a show. The Telegraph reckons that it has inside information on what’s going to be included in the top-secret opening ceremony of the Olympics. …a third “act” of the ceremony will look at the post-war transformation of Britain, with models of Big Ben and other London landmarks, and a parade of dancing nurses and ancillary staff pushing hospital beds to represent the NHS and the Welfare State. Oh good. Can’t wait for the dancing nurses. I hope Emmeline Pankhurst will actually be on a skateboard. Get Terry Wogan to do the commentary. 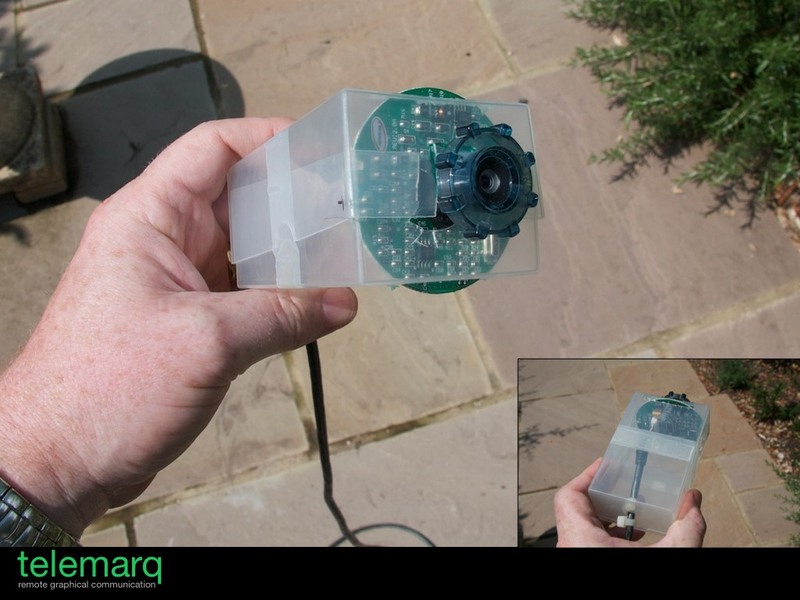 This is the third and (probably) final post in my series about enabling IPv6 on your home network. The first, Banish Mavis and Connect to the Future, explains the basics and why I think this stuff is really important. 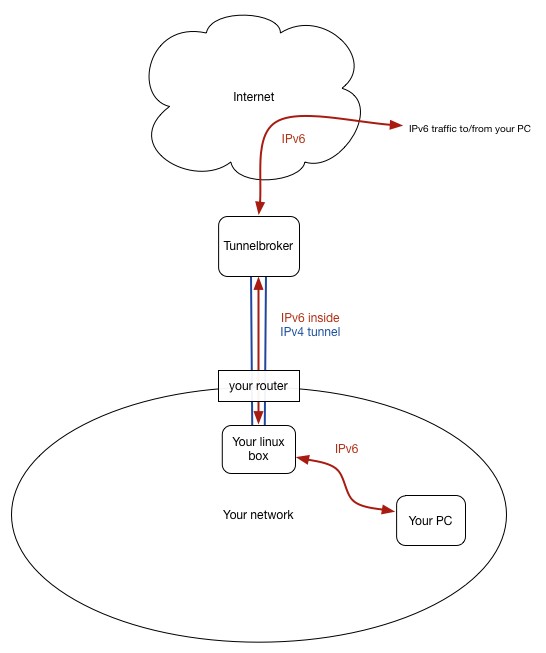 The second, Tunnelling your way to the future, tells you how, if you have a Linux box on your network, you can give full IPv6 connectivity to all your machines, even if your ISP doesn’t support it yet. This is all great fun, but at the end of the last article I pointed out that there were also security considerations associated with making all of your machines accessible to the ravages of the outside world, and it was only something you should do if they had a modern operating system, up-to-date security patches, and were running a firewall. This may, understandably, make you feel a little nervous, so in this final section I’ll show you how to implement a simple firewall on the machine that’s acting as your IPv6 gateway, so you can choose what traffic you want to let in, from where, and to which machines. This is still, by the way, very much better than the old NAT-based world of IPv4, because you are separating policy from capability: you can choose to allow SSH and HTTPS traffic to two different web servers inside your network, FTP access to one of them, and plain HTTP to a webcam, and give them all proper DNS addresses, while still blocking incoming connections to anything else. As a simple example, I’m going to explain how to set up a firewall that allows incoming HTTP, HTTPS and SSH connections over IPv6 but blocks everything else, so you’re not at risk when, say, enabling file sharing between your home computers. If you set up your system as per my description in the previous article, your linux machine is connecting to an IPv6 tunnel provider, receiving the IPv6 packets for your network on a virtual interface we called he-ipv6 and routing them out to your network over the normal ethernet interface, eth0. Now, the way in which the Linux kernel routes data between interfaces is controlled by an internal table of rules, which is used to examine each packet and work out whether and how to send it on its way. These tables can be manipulated from the command line through a utility called iptables, or ip6tables for the IPv6 variant, and you could use these to set up the rules you need to let some stuff in and keep other stuff out. It’s all very powerful, but unless you are part-robot yourself, trying to do much of this will make your brain hurt. This is the assembly-language equivalent of network configuration; you can make it do anything, and a very large number of the options you could choose will be the wrong ones. Eventually, you will get everything nicely set up, and all will be well until 18 months down the line when you have to change something and you have to remember what all those arcane lines of configuration were about. So we’re going to use a system called Shorewall, which has a nicer way to describe what you want in a few simple configuration files, and then arranges all that iptables stuff for you behind the scenes. This will install both shorewall (the IPv4 version) and shorewall6, and will create configuration directories /etc/shorewall and /etc/shorewall6. otherwise the machine will stop operating as a router. OK. Now we’re going to create four configuration files. Four?, I hear you squeak. Yes, four, but trust me, they’re wonderfully brief and straightforward. We’re just going to create them from scratch because they’re so simple. We’re going to define three ‘zones’: net, which represents the outside world, fw, which represents the firewall itself, and lan, which represents your local network. We’re going to say which network interfaces connect to each zone. We’re going to define the basic high-level policy of how data can flow between zones. Finally, we define some rules which specify in more detail the connections that are and aren’t allowed. See? At least the naming is nice and logical. There are man pages describing these in detail if you want to know more – just run man shorewall6-zones, man shorewall6-interfaces, etc. I’m certainly not an expert, having tried this for the first time today, but the following files work for me. By default, data from the firewall or LAN destined for the outside world is accepted. Data from the outside world is dropped. Everything else is rejected. And you should then find that you can make outgoing connections, for example to ipv6.statusq.org, but not incoming ones. If you don’t have easy access to an external IPv6-capable machine, try using a service like this one on mebsd.com to ping one of your internal IPv6 addresses. It should fail. Finally, in this file, let’s define some rules to let in ping, http, https and ssh. Well done! There’s an amazing amount more you can do with Shorewall – have a look at the man pages – but that at least should give you the basics and let you sleep at night! Feedback and suggestions welcome, as always: I’m a novice at this too. 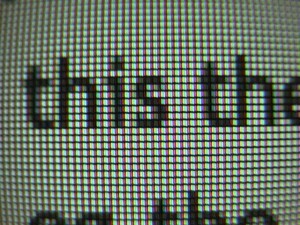 For the Telemarq Pen, the writing’s on the… screen? Some of my readers will know about plans I started hatching about seven years ago, but worked on again more seriously last year, for a new device, which I called the Telemarq Pen. The basic idea is that writing and drawing are incredibly important aspects of human communication – as demonstrated by the number of whiteboards we put in our offices – and yet something that is very poorly served by current technology. The nearest we get to a widely-deployed drawing device is the iPad, which isn’t designed for it and reduces most artistic endeavours to the level of crude finger-painting. 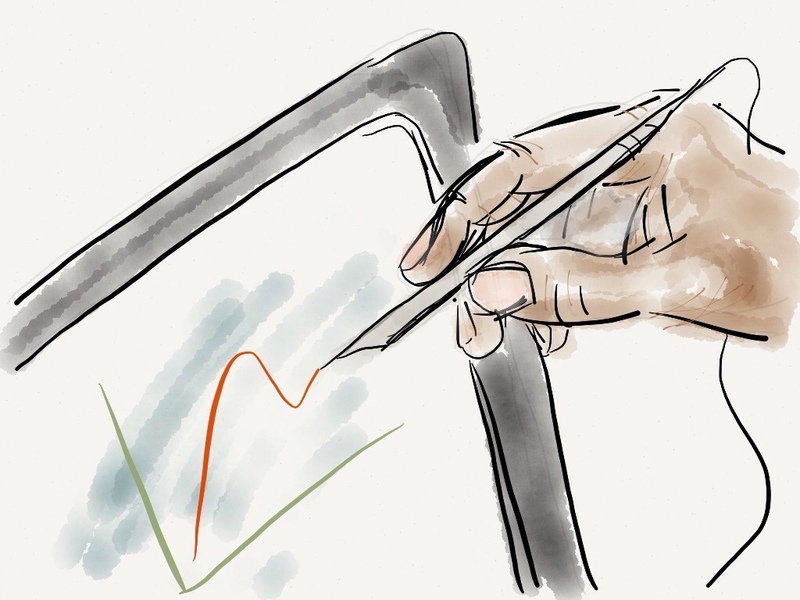 I had an idea for a low-cost stylus that could be used with any LCD display – a phone, tablet, laptop, even a TV – and yet would allow for exceedingly high-resolution drawing. 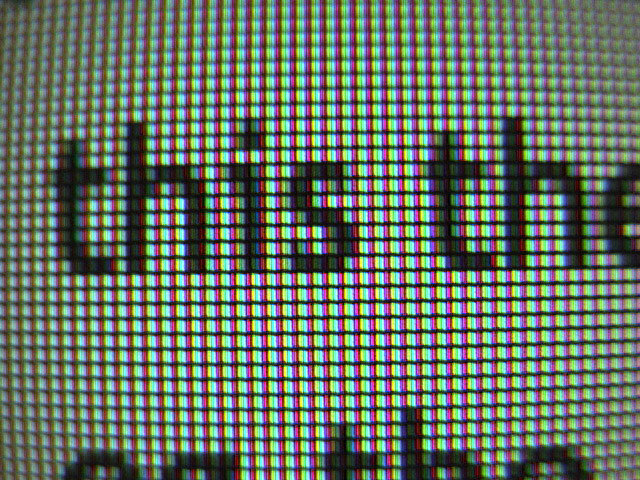 The basic idea was to include a small camera – something that now costs very little – pointing at the screen, and use various cunning techniques to recognise the pixels at which it was pointing. I reckoned I could locate the pen on the screen at sub-pixel resolution, so it would be a very accurate drafting device, and yet could be made for a few dollars. I did some experiments, wrote a draft patent, produced a nice slideshow, and was on the verge of going out and pitching it to investors. If you look carefully at the Telemarq logo you can see that pens were on my mind when I designed it! But at the start of this year, other things – mostly the need to earn some money again – put my plans on hold. Which, it turns out, was just as well. In May, an Apple patent was published showing that they had had very much the same ideas. Today, there’s a report of, guess what, Microsoft’s prototype optical stylus. Now, I suppose I could be kicking myself that I didn’t file some patents six or seven years ago, when I first started pointing cameras at screens – but I couldn’t have afforded it at that point, and however good your patents, it’s a brave man who takes on both Apple and Microsoft’s lawyers! It would have been much more likely to result in ruin than riches. A clear illustration of the problems of the current patent system, perhaps? So, in fact, I’m very grateful that the Fates conspired to make me abandon the project six months ago. But I can still go on at great length to anyone who’d like to buy me a beer about why such a device is vitally important and how it should be done! I hope they pursue this seriously, beyond simply filing IP, because I, at least, would be an enthusiastic customer. 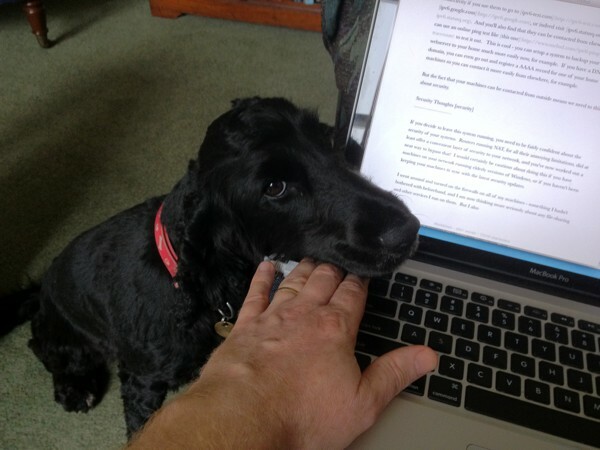 So perhaps I’ll get my pen in the end! My friend Mark Elliott, who teaches in the Law Faculty here in Cambridge, has started a fabulous blog called applyingforlaw.org, which both gives some insight into what studying law is all about, and discusses some of the legal issues behind topics currently in the news. I know this may not seem like a focal point for most Status-Q readers, but, especially if you do have friends, family, kids, nephews or nieces thinking about studying law, politics etc, or even with a general interest in it, do point them at applyingforlaw.org – it’s a great resource, and an enjoyable read. Update – Mark has now moved his site to publiclawforweveryone.com. In this longish and somewhat technical post, I’m going to tell you how to connect your home or office network to the brave new world of IPv6. Why would you want to do this, beyond the sheer joy of an educational experience, and having something cool to drop into the conversation at your next job interview? Well, if you haven’t seen it already, my previous post, ‘Banish Mavis and Connect to the Future’ , explains why this is more important than simply ensuring there are enough IP addresses to go around. At the end of the article, I’ll talk about some of the security issues you should be aware of in this brave new world! The first thing to do is check that you haven’t got IPv6 connectivity already. Go to http://ipv6-test.com – a very handy site – and see what it says. It’ll probably tell you you’re connecting by IPv4 because, at the time of writing, very few ISPs have switched on IPv6 for their customers. If all goes well, you’ll be able to try this URL soon and get a different result! In general, every network interface will have one of these fe80 addresses. They’re created automatically from the MAC address: if you look at the example above you’ll be able to see that some of the digit sequences occur in both the MAC address and the IPv6 address. but this probably won’t work. Why not? and you should see things happening. (Type Ctrl-C to stop it). You can ping the same address from another machine on the network but remember that the zone index – the name of the interface you’re going to use – may be different. This is one of the many small cool features of IPv6 – there is at least one valid address that will let you contact a device on your local network, even if the device has never had one allocated by hand or by a DHCP server. This will be really handy in future when you need to set up some gadget out of the box by pointing a browser at it. So, you have IPv6 on your local network, at least. It’s a bit like having a small railway system on your own island. But, until your ISP builds some bridges, you can’t use it to travel to the mainland unless you dig a tunnel. That’s what we’re going to do, and it is actually quite common at the moment, so don’t worry that you’re doing anything too eccentric! The following process sounds a little complicated, but in fact it’s very easy once you understand what’s going on. The description is long, but the actions are few! A Linux machine on your local network – it doesn’t have to be anything special. These instructions assume a recent Debian/Ubuntu-type system. A reasonably static public IPv4 address on your home router. If you’re on a cable connection, you probably have this. If not, you can still try it out, but you may need to tweak things manually or using a script whenever your public IP address changes, a bit like DynDNS. If you don’t have these, don’t worry; most of what you’ll learn here can be tweaked to work on different systems. The important thing is to understand what’s going on. First, you need someone to allocate you a chunk of the IPv6 address space, so you can give addresses to your machines, and for that someone to tell the world that they can handle data for those addresses (which they’ll forward to you through a special tunnel). 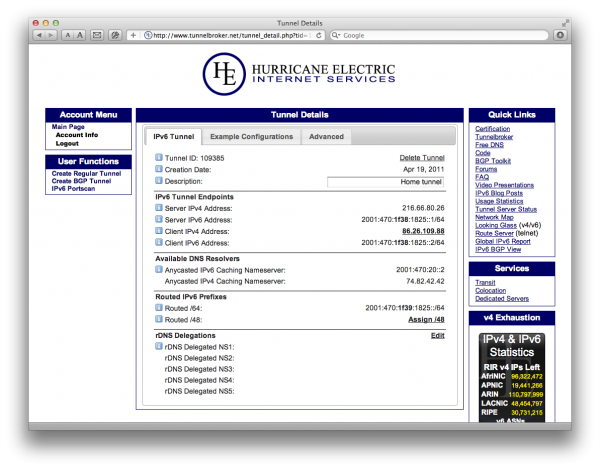 There are several organisations that will do this, but we’re going to use the excellent free Tunnelbroker service from those nice people at Hurricane Electric. So how will IPv6 packets get to you from the outside world? Tunnelbroker will put them inside IPv4 packets, send them to you (hence the need for a fairly static IP address), and your Linux box will unpack them and send them out on your local network. This is actually more efficient than it sounds, and there are Tunnelbroker endpoints in several different parts of the world, so the tunnel can be a short one! Finally, we need a way for machines on your network to know what their IPv6 address is, and how to send packets back through the tunnel to the outside world. We’ll do this by running a bit of software on your Linux machine called radvd – the Router Advertisement Daemon – which is roughly the equivalent of DHCP. The best thing about all this is that it runs alongside your normal IPv4 system, which just keeps working as before, so it will only kick into action when you’re using IPv6, and won’t get in the way otherwise. Go to http://tunnelbroker.net/ and register for an account, then click the ‘Create Regular Tunnel’ link. It’ll ask you for your IPv4 endpoint – this should normally be the public IP address of your router – that’s probably the IPv4 address you saw if you went to ipv6-test.com earlier. You’ll also need to give it a description, and pick a Tunnelbroker endpoint that’s close to you, for maximum efficiency. The important bits here relate to the diagram above – make sure you understand these next two paragraphs. Look at the section marked IPv6 Tunnel Endpoints, and the tunnel illustrated in the diagram above. The Server IPv4 Address is the address of the Tunnelbroker end of the tunnel and the Client IPv4 Address is the public address of your end of the tunnel, generally the address of your router. The server and client IPv6 addresses are the addresses of the IPv6 link within that tunnel, as indicated in the diagram by the red arrow within the blue tunnel. The Routed IPv6 Prefixes section, on the other hand, shows the prefix for the addresses that will be used on your network; the addresses that Tunnelbroker is going to route to your machines. These are very similar to but not the same as the addresses within the tunnel. They even use bold to emphasise the difference but it’s easy to forget and use the wrong one. When we set up the tunnel we’ll be using the addresses with 1f38 in them, and when we use radvd to advertise the addresses to use on your network we’ll be configuring it with the 1f39 addresses. In all the following examples, of course, you’ll need to put in the addresses specific to your tunnel. This sets up the tunnel and creates a local interface called he-ipv6 that represents this end of it. We won’t go through all of it, but the last couple of lines – post-up and pre-down – tell the system that the default route for contacting the IPv6 world should be through this tunnel interface (and not, for example, through the machine’s ethernet interface which soon have an IPv6 address of its own. This shows you your end of the tunnel, the IPv6 address ending ::2, and you can ping6 the other end, the address ending ::1. Hurrah! Your Linux machine, at least, now has a public IP address. which just tells the system to re-read the file. You’ll have a section for eth0 already – this can be added separately because it’s configuring it for ‘inet6’. If it worked, you can use ifconfig eth0 to see the new address. So now your Linux box has a fixed IPv6 address on your local network interface and another one on the tunnel interface, and should be able to route traffic between them. We just need to tell the other machines on the network which IPv6 addresses to use, and that they should send traffic for the outside world to this machine. or restart it if it’s already running. And now, a magical thing will start happening! The other machines on your network will start to get, in addition to their `fe80:: addresses discussed earlier, automatically-allocated addresses in your own IPv6 prefix. Log on to another machine and have a look at ipconfig, or in the Advanced > TCP/IP section of System Preferences, or wherever, and you should see addresses beginning 2001. In fact, each interface may have two of these addresses in addition to the automatic fe80 one. That’s because one of them is, like the fe80 range, based on the MAC address of the hardware. It is predictable and will always refer to that machine, and you can deduce the MAC address of the machine from it and vice versa. Some people are worried about the security implications of this: my laptop could be recognised as being mine, whichever IPv6 network I’m using it on. So on most systems there will also be a temporary address which is used by default for outgoing traffic and which is less traceable. You should now find that the other machines on your network will show IPv6 connectivity if you use them to go to ipv6-test.com, or browse to ipv6.google.com, or indeed visit ipv6.statusq.org. And you’ll also find that they can be contacted from elsewhere; you can use an online ping test like this one to test it out. This is cool – you can setup a system to backup your webserver to your home much more easily now, for example. If you have a DNS domain, you can even go out and register a AAAA record for one of your home machines so you can contact it more easily from elsewhere, for example. But the fact that your machines can be contacted from outside means we need to think about security. If you decide to leave this system running, you need to be fairly confident about the security of your systems. Routers running NAT, for all their annoying limitations, did at least offer a convenient layer of security to your network, and you’ve now worked out a neat way to bypass that! I would certainly be cautious about doing this if you have machines on your network running elderly versions of Windows, or if you haven’t been keeping your machines in sync with the latest security updates. I went around and turned on the firewalls on all of my machines – something I hadn’t bothered with beforehand, and I am now thinking more seriously about any file-sharing and other services I run on them. But I also have to balance any paranoia with the fact that almost all of my systems are Unix-based, and running very similar software to hundreds of thousands of publicly-accessible webservers out there, including mine. The right way to deal with the security issues, of course, is to re-introduce filtering on the Linux machine that’s running your tunnel. You now have the option to let through any connections you like, to any machine on your network, but the default should probably be to block everything except perhaps ssh, and only open up extra options as and when required. This may feel like a return to the dark days of NAT, but in this case, when you do decide to allow, say, telephony traffic to your VoIP phone, you’re getting a proper end-to-end connection from one machine to another, and not depending on a cheap NAT router maintaing a table of temporary mappings. Configuring Linux IP tables is not for the faint-hearted, though. I’ll have a look at whether there are any easy-to-manage systems out there that would be good for this kind of use. Any recommendations welcome! Update: I’ve now added a tutorial on how to do this with Shorewall. on the Linux box, and comment out the ‘auto’ line in /etc/network/interfaces so it doesn’t start up again on reboot. The London 2012 Olympics is probably the single biggest waste of taxpayers' money in my lifetime. It is depriving children of books, hospitals of nurses, and elderly people of care. The Olympics have been a financial disaster for almost every city that has ever hosted them and I object to such large amounts of my money being spent this way. I have no objection to people running round fields or kicking balls if they want to, and people who want to watch them are entitled to pay to do so. But public money should not be used to pay for it on this scale for one ‘trophy’ event for a few politicians. If you insist on spending £11bn on sports, a new gym and swimming pool for every school in the country would be a much better investment. I have visited three former Olympic venues now, and at each I have marvelled at the big, empty stadia with a few tourists wandering around them. Why does nobody learn that this is a Bad Idea when there is such a track record? Thanks to Taxbracket.org for use of the image. Cash in those patents – quick! It's long been clear that (except in a small number of specific fields) the patent system is very broken, and now serves chiefly to stifle, rather than encourage, innovation. If you still doubt this, read some of what Richard Posner has been saying. Or look at this CNET article from a few months back which points out that from 2002-2009 patent trolls and other 'non practicing entities' made more than three times as much from litigation as those who were actually using their patents. Or listen to this episode of TWIT about how all the phone manufacturers are suing each other in a huge flurry of paperwork. I'm sure many entrepreneurs dream of a world in which they could just opt out of the whole system and just rely on good old competition. Imagine if you could only prosecute someone for patent infringement if they also held patents. Ah, what a sweet thought! Remember War Games? Sadly, history offers few examples where unilateral disarmament has been a sensible choice. But we can at least dream. Fortunately, enough noise is being made about this state of affairs now that it is growing more and more likely that something will be done about it. And a thought occurred to me this morning: I wonder if the lawyers and their clients have cottoned on to this? Could it be that big companies and patent trolls alike have realised the danger that their patents may soon be a radically devalued currency? After my recent post about how much I liked Skype, and how much I disliked what they’d done to the Mac version recently, it seems only fair to point out that the worst aspect of the redesign – the amount of desktop space it takes up – has largely been fixed in the latest version. 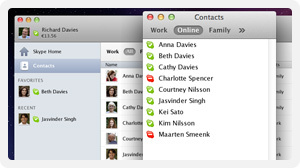 There’s now a ‘Contacts monitor’ window, which you can tuck down the side of your screen as in the good old days, and get rid of the main window (at least until you’re actually in a conversation). I still don’t think version 5’s layout is as good as 2.8’s, so I’m pleased that they still give you the option of using that version, but, with a bit of tweaking, it comes close. I’m also willing to believe that there may be improvements under the hood that are worth having. And it also looks as if they’re listening to their customers. So I’ve upgraded my machines.